Cormac Breatnach’s playing can be heard on more than 50 albums including Riverdance and his own solo albums, Musical Journey, Music for Whistle & Guitar and Éalú and on Film soundtracks The Secret of Roan Inish, The War of the Buttons, Horse + Moondance as well as Award-Winning TV programmes: Bringing It All Back Home, A River of Sound, Súlt and The Session. Cormac also featured on and presented TV programmes with Geanntraí in Greystones Co. Wicklow and with Ceolchuairt in the Basque Country. Apart from collaborating with Sonamus he collaborated with Bray-based guitarist Martin Dunlea (Music for Whistle & Guitar, 2000) and currently performs with harpist, Laoise Kelly and fiddler, Tola Custy as The Albiez Trio, as well as under the banner of Alchemy. 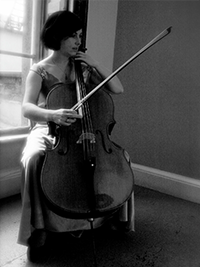 Annette Cleary studied with Coral Bognuda, Ivan Andrews and Aisling Drury-Byrne at the Royal Irish Academy of Music and subsequently, as the recipient of scholarships, continued her training in Austria (Mozarteum), Germany and the USA, numbering among her teachers Paul Tortelier, Antonio Janigro and Andre Navarra and obtaining her Masters Degree. Annette was a prizewinner at the Barchet International Cello Competition and from 1993 was prinicipal cellist with the D’Oyly Carte Opera Company. She has performed as soloist with the RTE Concert Orchestra and the NSO and acts as jury member for International Competitions. Annette teaches at the Royal Irish Academy of Music and where she recently received her Doctorate. Rachel Factor is a graduate of the Royal Irish Academy of Music and NUI Maynooth. She has performed with many of Ireland’s leading ensembles including The Irish Chamber Orchestra, Crash Ensemble, The Orchestra of St. Cecilia amongst others. Rachel has performed extensively throughout Ireland and most recently in London with solo harpsichord repertoire. 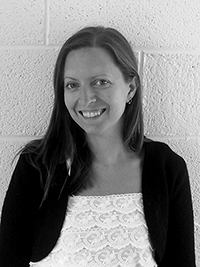 Rachel teaches locally in Co.Wicklow and is harpsichord professor and accompanist at DIT Conservatory of Music. She also holds position of local centre examiner at The Royal Irish Academy of Music. Rachel has always had an affinity with Baroque music and the harpsichord but it was not until she began her BA Performance studies as a pianist at the Royal Irish Academy of Music that she was introduced to the instrument. Her initial studies were with Gillian Smith and then later with Dr. David Adams. As a student at The Royal Irish Academy of Music she received numerous scholarships for harpsichord tuition and performed as soloist with The Academy Chamber Orchestra on two occasions. Upon leaving The Academy Rachel has received tutelage from many highly esteemed artists such as Carole Cerasi, Laurence Cummings, Malcom Proud and Christof Rousset in masterclasses. Rachel has since established herself as a soloist and chamber musician based in Dublin. She has performed with many of Irelands leading ensembles including The Irish Chamber Orchestra, RTE Concert Orchestra, Ulster Orchestra, Irish Baroque Orchestra Collaboration Projects and The Orchestra of St. Cecilia. Rachel has performed at many festivals throughout the country and has also performed concerts recorded and broadcast by RTE Lyric FM. Rachel also has a keen interest in contemporary music and has performed and toured with The Irish Composers’ Collective and The Crash Ensemble. She has premiered works by many emerging contemporary composers in Ireland. Rachel, alongside Trio Quattro recorded and premiered a work ‘Hiccup’ by Elaine Agnew 2008 as part of RTE Lyric FM’s contribution to the European Broadcasting Union’s project ‘Handel’s New Clothes’. Other recordings and broadcasts include ‘We Saw Heaven’ by Ken McHugh 2010 and online broadcast ‘ Interminable Delirium’ by Sean Read 2010. In 2010 Rachel received a generous bursary from Music Network’s Capital Scheme to commission a harpsichord. She now plays a single manual ‘petit ravelmant’ Flemish harpsichord by Andrew Wooderson after Ioannes Ruckers 1628. She gratefully acknowledges the support of Music Network and The Arts Council. In addition to his work with Tonos, Eamon enjoys performing in a variety of musical settings on Classical and Electric guitars. He is committed to music education and music in the wider community, including Early Years Music, Music in Healthcare settings, Guitar-group coaching and Community Music workshops. Eamon has harboured a love for Early and Folk music from a young age. He began his musical studies on the violin at the age of eight, and first picked up a guitar in his early teens. Initially influenced by Rock music, he subsequently studied Guitar with acclaimed Irish guitarist, Dr John Feeley, and received a BMus (1st Class) in Guitar Performance from DIT Conservatory of Music and Drama and Trinity College Dublin. 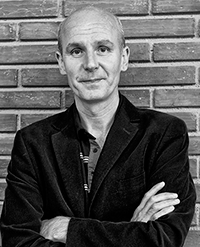 In 2006 Eamon was awarded the first musicology PhD to be accredited by DIT Conservatory of Music and Drama. His doctoral thesis investigated the five-course guitar’s role in the court of Louis XIV, a hitherto unexplored area of French Baroque music and Early Guitar performance practice. 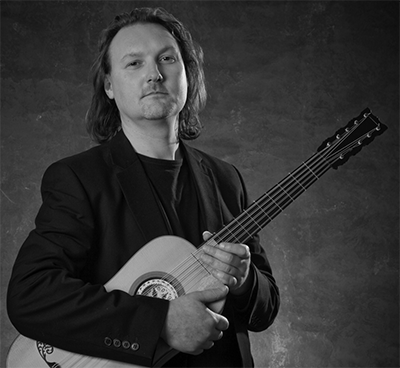 Eamon teaches and performs extensively, giving concerts, lectures, seminars and workshops, including for Walton’s Guitar Festival of Ireland, Dundee Guitar Festival, Bath International Guitar Festival, Sligo Festival of Baroque Music, DIT Conservatory of Music and Drama. He has been frequently broadcast in concert on RTE Lyric FM. Copyright © 2019 Sonamus. Powered by WordPress. Theme: Spacious by ThemeGrill.